- I've arrived at the airport. How do I get to the city? - How do I get to SBO/TGS? - I need a map of Tokyo! And the train stations! - I'm afraid of taking the wrong train or buying tickets at the wrong booth. - Where's a good affordable place for accomodation? - I need to practice before SBO. Where can I find a good arcade? - I want to attend SBO as a spectator. What do I need? - I'm an SBO qualifier scheduled to fight at the venue. How much extra do I have to pay to check out the game show? - Is there any way to make a last-minute entry into SBO? - I need SBO's schedule! - Any other notes about SBO that I should know? - Is it better to stay at a hotel around the venue? - Should I be concerned about Curfews? - Help, I need money! - I'm planning on traveling around Japan. Any good suggestions? - I've been to Akihabara before. What happened to that big store in front of the station with Kotobukiya and stuff? - Is tap water safe to drink? - Is there anything I should be cautious when walking around? - Radiation: How safe is it to travel to Tokyo? - Radiation: Is it safe to eat food in Japan? Got any other good questions not on the list? Mail here. I've arrived at the airport. How do I get to the city? You have two options: take The Skyliner or Narita Express. The Skyliner is a new line that boasts a short 36 minute ride to Nippori station. 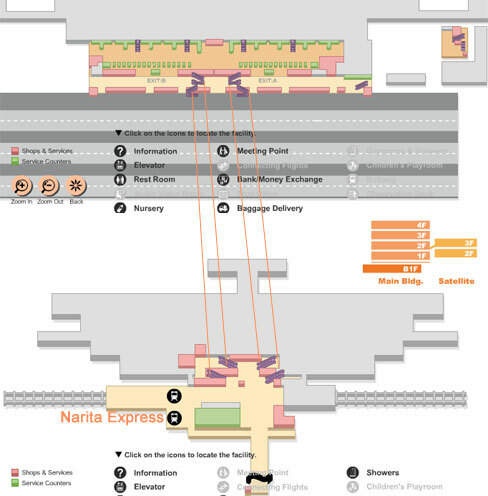 Narita Express is the traditional method and takes 70-90 minutes depending on destination (Tokyo - Shinjuku). Skyliner is generally faster and actually cheaper than the Narita Express (2400 yen vs 3110 yen). 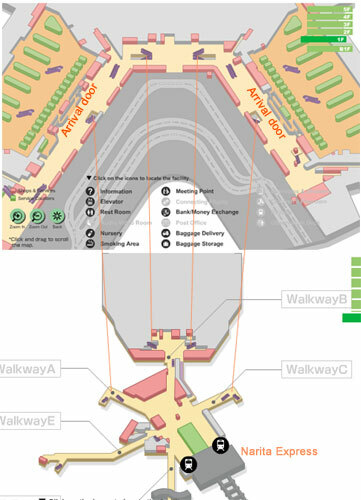 Download maps of the airport here (bottom two). Go through customs and you'll be at the arrival lobby. Purchase a ticket at one of the counters marked 5 on the map. You'll see escalators going downstairs to B1. Take it and you'll reach the enterance to the train station. Once you're at B1, be sure to read the directions on your downloaded map so you don't end up taking the wrong train. Ask the clerk if you're not sure. Go through customs and you'll be at the arrival lobby.You'll see escalators going downstairs to B1. Take it and you'll reach the enterance to the train station; buy a ticket at the counter. Multiple destinations are available including Tokyo station, Shinagawa, Shibuya , Shinjuku, and Ikebukuro. Ask the clerk if you're not sure. When getting on your train, make sure you have your time right, because if you get on the wrong time, that train might skip your station. Go through customs and you'll be at the arrival lobby. The Keikyu line station is connected from the lobby. Take it to Shinagawa station or Shinbashi station, and from there you can get out and change to the JR line or other trains and get to your destination. Costs 400 yen to Shinagawa.16 - 22 minutes to Shinagawa depending on local or express, 400 yen. 22-29 minutes for Shinbashi, 550 yen. How do I get to SBO/TGS? The Makuhari Messe venue has an official guide section here, but here's two general ways of getting there, together with maps. From Tokyo station, take the Keiyo line to Kaihin Makuhari. 32 - 42 minutes depending on local or express. Once you're at Kaihin Makuhari, exit and go left, then just follow everyone for a 6-8 minute walk to the venue. Train fare costs around 540-620 yen depending on where you're coming from. If you're a SBO contender and you need to hit the venue before the crowds arrive, here's a direction map. Note that there's an escalator to an overhead walkway that you need to take after a few minutes of walk on the streets. If you want to make sure that your train is on the right track, here's the list of stations it should pass. Tokyo station can be a bit hard to figure out if you're hitting the show earlier than most other people, but if you're hitting it around the same time as everyone else, it's easy- just follow the otaku looking crowd and you won't get lost. The map below indicates which way you need to go for the Keiyo line platform. 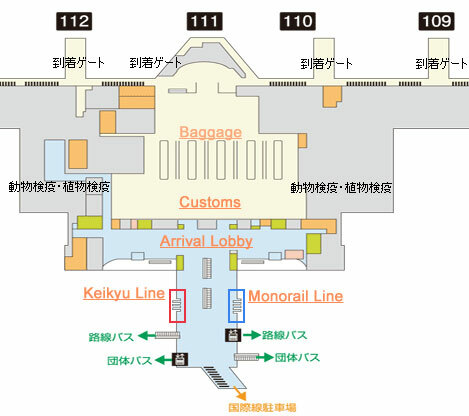 Note how the passageway for the Keiyo line cuts off on the map. There's a reason for that. The passageway is a bit long and you'll be walking for about 10 minutes before you can reach the platform. A pdf version of the map can be found at the bottom of the page here. From Shinkiba station, take the Keiyo line to Kaihin Makuhari. 22 - 30 minutes depending on local or express. Once you're at Kaihin Makuhari, exit and go left, then just follow everyone for a 6-8 minute walk to the venue. If you're a SBO contender and you need to hit the venue before the crowds arrive, here's a direction map. Note that there's an escalator you need to take after a few minutes of walk from the train station. Shinkiba station can be reached with the Rinkai line or Yurakucho line. This expensive method can be good on the way back, especially if you've got lots of leaflets from the show. You'll need to pay two train fares: one for your ride to Shinkiba, and 380 yen from Shinkiba to Kaihin Makuhari. For example, it takes 620 yen to get to the venue from Shinjuku taking the cheap way, but 920 yen taking this expensive way (540+380). For Ikebukuro, it's 690 and 950 (570+380) yen, respectively. The time it takes to get to the venue isn't too different between the cheap and expensive way. I need a map of Tokyo! And the train stations! The most obvious answer would be Google. 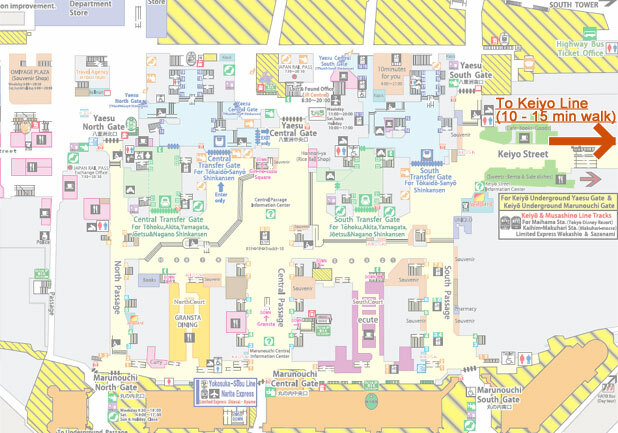 For some commercial district maps, also check out Tokyo Essentials. 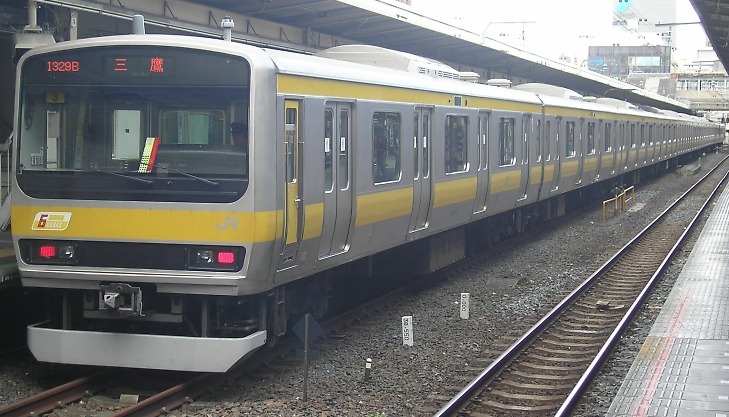 The JR train system, especially the Yamanote line and Sobu/Chuo line, will be your most used trains while in Tokyo. You can get a map of the JR train system here. 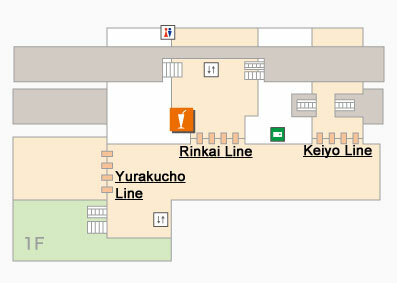 If you're afraid of getting lost at train stations, JR also provides maps of each train station here. As for the less-used subway system, you can download a map here. A crazy map with both the JR and subway stations can be downloaded here. I'm afraid of taking the wrong train or buying tickets at the wrong booth. Tokyo has a lot of different trains so it can be a bit boggling to even locals at times. But basically for tourists, all you really need to know are the JR Yamanote and Chuo-Sobu line since they'll take you to most of the main locations in the city. And of course the Keiyo line, for getting to the SBO/TGS venue. Here are a few pictures so you'll know what they look like, and logos so you won't buy tickets at the wrong vending machine. If you end up buying for a wrong train service, you can always refund by asking their staff. Where's a good affordable place for accomodation? Here are a few well-known cheap stays in Tokyo. A backpacker's inn. Small rooms, but dirt cheap at 2,300 yen per day. Not located in a commercial district nor around a JR line, meaning it's not in the direct heart of the city. Has wifi. No Curfew. A small Japanese inn dedicated to foreign travellers. Small rooms, a bit more expensive than New Koyo starting at 4,000 yen per day. Conveniently located in the commercial district of Ikebukuro that has some well-known arcades. 8-10 minutes from JR yamanote line. Wifi available on first floor. 1AM Curfew. No TV in room. Chain motel located throughout Tokyo including Ikebukuro and Akihabara (5 min walk to JR Sobu line, 15 min walk to Akihabara). Regular sized rooms, price ranges from 5,480 yen and higher depending on the motel. More expensive than New Koyo and Kimi Ryokan but you get what you pay for; each room has its own showering/restroom facilities, LAN connection socket, empty refrigerator and more. Wifi and free-for-use PC available at lobby. Laptop PC available for rent. I need to practice before SBO. Where can I find a good arcade? Fortunately for you, there's the Arcade Guide for Tokyo on this site. Check out the FAQs section. I want to attend SBO as a spectator. What do I need? A good friend who lives in Japan. Tickets are going fast even at the price of 3,500 yen (includes entry ticket to Tokyo Game Show). Tickets can be purchased through Lawson. Note: The organizers of SBO have mistaken the ticket code printed on posters and magazines. If you had someone trying to get you a ticket with it, the correct L-code is 34446. I'm an SBO qualifier scheduled to fight at the venue. How much extra do I have to pay to check out the game show? If you're an SBO qualifier, you can check out the Tokyo Game Show for free after you've registered yourself for the tournament. Note however that there are time restrictions where you can't get out of the SBO area. Is there any way to make a last-minute entry into SBO? If you purchase the official SBO pamphlet sold at the venue, it comes with an entry sheet for reserved slots. You can use it to fight for your final chance to enter SBO. Entries for the reserved slots tournaments are accepted from 7AM to 8AM. Note that you of course need a spectator ticket beforehand. Any other notes about SBO that I should know? You need to have your Tokyo Game Show ticket at hand when entering the venue. Don't mistakingly give the staff your SBO ticket instead. The SBO's enterance is at Hall 7. Don't go to Hall 1, because that's the enterance to the Tokyo Game Show. Enterance begins at 9 AM (leave aside last minute entry participants mentioned above). Once in the SBO area, you can't move to the Game Show area until after 11:30. Is it better to stay at a hotel around the venue? If you're there for SBO/Tougeki, the quick answer is no. Most hotels around the area always get booked by gaming press for the Tokyo Game Show and they hog the internet lines at the hotels. Moreso, you can't get gaming practice around there. It's better to get accomodation in the city. Should I be concerned about Curfews? Not nessesarily. Trains in Tokyo stop a little before 1AM, so chances are if you're out by that time, you won't be able to get back to your hotel to begin with. Also, note that arcades close by midnight (some on 1AM) by law. So unless you're planning on partying at a friends house until late or something, curfews aren't all that important. It's life, we all do. Fortunately, you can withdraw money from post office ATMs using most credit cards or debit cards. 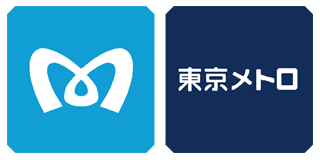 Post offices in Japan are marked with a T-like symbol. You can also try going to a Seven-Eleven convenience store and withdraw from their ATMs. If all fails, there's citibank. A list of their ATM machines are available here. Note that some people may have limits to how much they can withdraw on a single transaction while overseas. If you seem to be getting errors, try withdrawing a smaller amount before you decide to give up. Finding exchange counters to change your currency to yen during your trip can be a bit of a nuisance, so try not to bother. Bring yen, shop with credit cards, and withdraw from the ATMs. I'm planning on traveling around Japan. Any good suggestions? One: Get a JR rail pass. It's God's gift to tourists. You can travel all around Japan on the national JR railway for a week with just the same fare as a single round trip from Tokyo to Osaka on a Shinkansen/Bullet train. And yes, you can use the Shinkansen too (excludes Nozomi and Mizuho trains, which are like premium). I've been to Akihabara before. What happened to that awesome big store in front of the station with Kotobukiya and stuff? It's going under renovation. The tenants have temporarily moved to other locations in Akiba. Here's a brief list. Yes, and it tastes like any major city's tap water. But if you want American water that you're used to, buy yourself some Crystal Guyser since it's cheap and available at many stores. Is there anything I should be cautious when I'm walking around? First, keep your passport with you at all times in case you get questioned by an officer. It rarely happens, but it can be a pain if you don't have an ID. Second, don't carry any concealed weapons like a short knife for self-protection. Tokyo is overy policed extremely safe, and you'll be in more trouble with it than without it. It's a country where you can get arrested for just having golf clubs in the back of your car: cops can decide to conveniently interpret them as a blunt lethal object to score their quotas. Radiation: How safe is it to travel to Tokyo? The radiation levels in Tokyo are low that you don't have to worry about walking outside. A few locations on the east side of Tokyo such as Adachi-ku (home to Daigo Umehara), Katsushika-ku, and Koto-ku are considered a bit high, but they're residential districts and not locations that you'd normally end up during a vacation. Even if you do wind up there, it's nothing you need to be worried about during a week or so of a short trip. It's something you need to worry if you're going to live there for many years. In figures, Tokyo's pre-incident radiation level was around 0.034usv/h, and it's currently at around 0.055usv/h. It's yanked up a bit, but it's still low compared to other major cities such as New York (0.095/h), and Hong Kong (0.14usv/h). Radiation: Is it safe to eat food in Japan? Eating radiation-contaminated food from the heavily effected regions in Northeastern Japan is a scary thought, but don't forget that if you've been eating imports from some areas of Europe including Italy since 1986, you've probably been consuming some radioactively contaminated food during your life on a normal basis without even knowing it. Most citizens in Tokyo aren't giving it much thought, but every now and then there's news of food being discovered to be contaminated beyond acceptable levels. It shouldn't be much of an issue for a short trip but if you want to be super-safe, there's two options you can take. 1. Enjoy the food in Japan. Hell, you've paid for your expensive plane fare, why pull back on such a short trip? In case you're scared, you can bring apple pectin pills and take them after meals, which effectively flushes out ingested radiation (Cesium137). Better yet, bring Vitapect, which is apple pectin with additional vitamins to supplement any that gets flushed out together. 2. If you want to play super-super-safe, you'll be losing out on the food experience but you can always go somewhere that doesn't make most of their food from local sources, like Mcdonalds. Their beef is from Australia and their potatoes are from the States. You can also go to import stores like Akihabara's Food Shop Watabe where you can buy canned goods, various drinks, and other goodies.